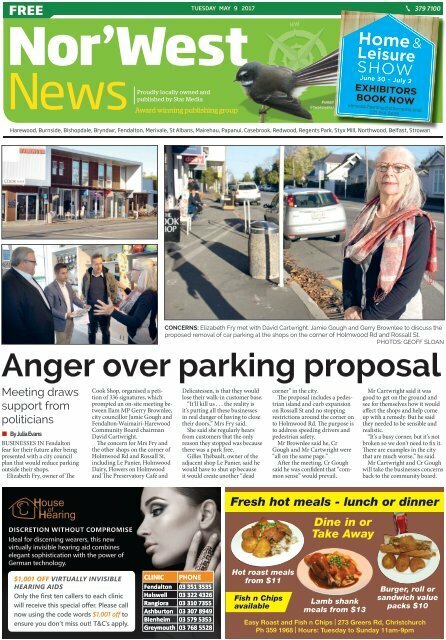 4 Tuesday May 9 2017 Latest Christchurch news at www. .kiwi News NOR’WEST NEWS McMaster & Heap Veterinary practice OUR VISIT TO UC DAVIS, CALIFORNIA Steve, Isaac and myself recently spent time at UC Davis, the #1 Veterinary school in the world. For 2 years running it has received this huge accolade and when you are there you can see why. It operates and is the size of a mini CHCH Public hospital. They are a teaching hospital as well as seeing referral patients and first opinion clients. Their specialities include 24/7 emergency and critical care, cardiology, neurology, ophthalmology, oncology and surgery. They were originally set up to see 5500 patients per year, last year they saw 50,000 patients. Everyone was so friendly and helpful and enthusiastic about being part of this college. It had a wonderful vibe... Isaac was hooked. Approximately 140 students get accepted yearly in to Davis, with around 10% being male. It cost about US$45,000 for tuition( $64000 NZL) and then there is living costs on top of that. Vet students on average come out owing US $135,000. These students have spent the previous 4 years obtaining an excellent undergraduate degree just to get accepted, majoring in science and maths. There are 30 colleges of Veterinary Medicine in the US and each year about 3000 students get accepted. About 40% of students who apply get accepted somewhere. In your 3rd year you start to branch off in your area of interest – either companion animal, equine, mixed practice or production animals. After their 4 year degree at Davis, most will apply for 1-2 year internship at another Veterinary College to further their skills in an area they are interested in. Davis don’t offer internships. Our freshman (first year) guide loves dentistry so her plans are to become a specialist in this field. After her internship, she then needs to apply for a residency at one of the 30 colleges, which could be anything from 3-5 years more study!! These are hard to come by, and you have to be the best of the bunch, although a Vet degree from UC Davis stands you in good steed. So to be a specialist in your field in the US takes between 13-15 years, and the debt these students accrue is massive, a few get scholarships, but most have to pay. I met a vet in her 40’s who still has a student loan. Steve spent 2 days tagging along with ophthalmology specialists, residents and students on rotation. First and second year students get at least 2 weeks of ophthalmology per year ( 27 years ago when I studied at Massey, 1 day was dedicated to “eyes”). He really enjoyed the collegial discussions on cases, sussing out all the latest equipment, chatting to the students and doing rounds with them. Steve came away pleased with his skills and expertise in ophthalmology, although a few pieces of equipment caught his eye. Isaac and I thoroughly enjoyed our 3 hour tour of the entire faculty. Isaac loved the exotics hospital where they house and treat the reptiles, birds, rabbits, turtles etc. We also visited their raptor centre, home to rescued birds of prey that can no longer see or fly. He also enjoyed watching elbow arthroscopy on a Golden Retriever from a viewing room. He could see them cutting and sucking out torn cartilage from the video screen. What amazed me was the amount of people in theatre – 9 in all, including the chief surgeon, 2 residents, 3 anesthetists and 4th year students. There were so many people milling around keenly observing. They do MRI and CT here and even have a massive MRI machine that can fit a horse into. The most expensive patient to date was a spoodle who underwent dialysis for 18 months, visiting the hospital twice weekly to have all the toxins removed from her blood. Her final account was US$140,000! The most expensive piece of equipment is a linear accelerator used for radiation treatment for cancer patients costing a little over 1 million. Apparently one of the only surgical procedures NOT performed here at Davis is renal transplants as when attempted on cats over 10 years ago, the survival rate was poor. A handful of colleges perform renal transplants in cats including the Pennsylvania and Georgia College of Vet medicine. We thoroughly enjoyed our time spent at Davis and I thought how amazing, fun and expensive it would be to be a student now studying vet medicine at UC Davis. The students we met were just so absorbed, very happy and grateful to be at this world class faculty. I came out thinking I am so in the right profession. -Dr Michele McMaster RECORD HOLDERS: Ngaio Marsh Retirement Village residents Jenny Duncan, Alice Mueller and Val Muirhead at the record exercise class with leader Nicki Brown. ​ Ngaio Marsh village retirees part of record fitness attempt SUPER LIQUOR BURNSIDE Now open! Super Liquor Burnside 501 Wairakei Road Burnside Christchurch 03 359 0556 CORUBA & COLA 10 x 330ml Bottles, 5% $ 24 99 WOODSTOCK & COLA 12 x 330ml Bottles, 5% $ 20 99 AN AUSTRALASIAN record has been set by more than 3000 retirees who took part in a synchronised fitness class hosted by a retirement village in Papanui. Across Australia and New Zealand, 31 Ryman Healthcare retirement villages were linked via YouTube to set a record for Australasia’s biggest synchronised fitness class involving elderly people. Ngaio Marsh Retirement Village hosted the record attempt, with fitness guru Nicki Brown leading the session. Black Fern Kendra Cocksedge and Ryman managing director Simon Challies were at the Papanui event. Mr Challies said the aim was to preserve residents’ independence, reduce the risks of falls and get them to try new things. However, he had no idea the classes would be so popular. “It was a bit off the wall, introducing circuit classes with swiss balls, weights and bands, to a group of people it was a bit foreign to. It was like Les Mills meets Ryman,” he said JOHNNIE WALKER RED 1 Litre $ 37 99 JACK DANIEL'S 1 Litre $ 47 99 SPEIGHT'S 15 x 330ml Bottles $ 22 99 Open 7 days Cnr Hoon Hay & Coppell place phone 338 2534, Fax 339 8624 e. mcmasterandheap@yahoo.co.nz www.mcmasterheap.co.nz McMaster & Heap Offers end close of trade 21st May 2017, while stocks last. Available at participating stores only. Limits may apply. Trade not supplied. Terms and conditions may apply. Available 8th - 21st May 2017 inclusive. Please see www.superliquor.co.nz for details.